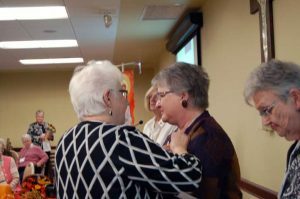 November 7, 2018, Chicago – Sherrie Ashley, a retired special education teacher and current teacher’s aide living in Manteno, Illinois, became the newest Adrian Dominican Associate during the annual Fall Chapter Assembly of the Adrian Dominican Sisters’ Dominican Midwest Mission Chapter, based in Chicago. The assembly was held October 27 at the Mercy Center. 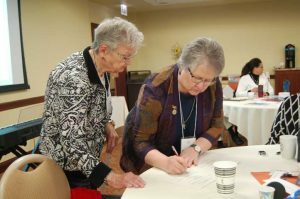 Associates are women and men, at least 18 years of age, who make a non-vowed commitment to share in the Mission and Vision of the Adrian Dominican Sisters. While maintaining their independent lifestyle, they participate in ministries and activities of the Adrian Dominican Sisters.